Because America is overrun with Biblical creationists seeking to impress a particular strain of conservative evangelical Christianity on the country, we tend to ignore other forms of creationism, including the Islamic creationism fashionable in the Muslim world and spread under the auspices of leaders like Adnan Oktar, the Turkish creationist who runs an international outfit under the pseudonym Harun Yahya. Like its Christian Intelligent Design counterpart, Islamic creationism casts itself as scientific and appeals to the glamour of science to spread its message. I bring this up because Graham Hancock has just posted an article by Canadian Islamic creationist Nadeem Haque, who wishes to prove the unity of science and Islam through appeals to pseudohistory. There is a race where the individuals are tall and very agile and have wings, and whose language is formed by the snapping of fingers. In another race, the individuals have the bodies of lions and birds’ heads, covered in hair and having long tails, and their language is a buzzing. In another, they have two faces, one in front and one behind, and several feet; their language is similar to that of birds. These nations are the djinn; there is among others a kind of djinn which has the form of dogs, complete with tails; their language is an incomprehensible growl. 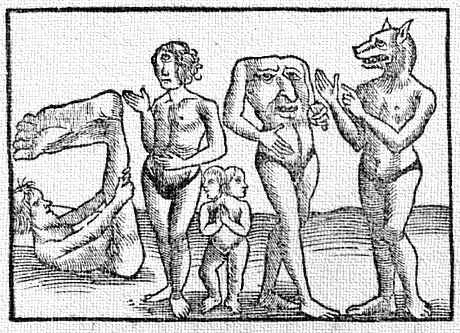 In another of these races, individuals resemble men except that they have their mouths in the middle of their chests and speak by whistling. […] Others look like women, with hair and breasts; there are no males in this race; these women are made pregnant by the wind, and they bring forth that individuals who resemble them; they have lovely voices and they attract many people of other races by the charm of their voices. […] They say that these nations interbred, and that the number of distinct races grew to one hundred and twenty. Compare the pre-human Djinn to the peoples of the East from Mandeville’s Travels. Look familiar? The author goes on to survey various opinions about the pre-human races and declares that these djinn were known to the Greeks, Persians, and Indians. According to our author, only the spirits remained of the pre-Adamic races, which were in bloody wars with one another, after Iblis (Satan) and the Fallen Angels came to earth and massacred the djinn in order to establish his dominion over the earth. (Compare this to the spirits of the evil Giants remaining after God destroys them in 1 Enoch for their warfare and cannibalism.) But our author also reminds us to take the stories he reports with a grain of salt. “Whoever reads our book will have to take the stories reported herein with caution. In Allah we find our help, our strength, our salvation, and our endurance.” I didn’t think anyone in this day and age would take medieval folklore seriously, but of course I was wrong. Haque wants us to take medieval Islamic folklore, shorn though of its most ludicrous trappings, as an accurate depiction of the prehistoric earth, and one he also says is supported by the Quran. Anyway, Haque follows an old but minority view of the Quran that holds that because the angels know before the creation of Adam that humankind will be wicked (2:30) there must therefore have been previous human races that they witnessed fall into sin. This is not a whole lot to hang an argument of not just antediluvian but prehumen civilization on. Most of Haque’s article is a long bit of sophistry trying to explicate this verse into a scientific theory. Its success depends entirely on how much you already agree with his foundational principles of Quranic literalism and the truth of medieval Islamic folklore before you started reading. In so doing, Haque ropes in Robert Temple and other ancient astronaut writers to support his acceptance of medieval Arabic pyramid lore, making the pyramids pre-Flood in age, and part of a global megalithic culture that he sees as the “First Global Ummah” (an Islamic cultural community) made up of all of fringe archaeology’s favorite “pre-Flood” monuments, like Yonaguni, Atlantis, etc. Now by proving from the Quran, that macroevolution has indeed occurred on earth, and that Adam is not the first modern human but that humans have evolved, albeit with a non-God-of-the gaps mechanism involving mizan (the balance) and not natural selection, it is akin to solving the first problem of the shift from the geocentric to the heliocentric system. The second step is briefly presented in this article, where it has been shown that a special civilization was a precursor to Adam. With these two-steps, we reach a platform comprising a total historical paradigmatic shift. From this vantage point, a clear vista of our origins and destiny can be witnessed, with its resplendent panoramic view, comprising altruistic pan-ethicism: rational, compassionate, timeless and universal. In fact, any system of belief that does not possess such properties, is not worth adhering to. One of the races that is most similar to man is that of the Wakwak. These individuals hang from branches by their hair; they have breasts and sexual organs similar to those of women, and they have a ruddy complexion; they constantly shout “Wak Wak!”, and if one of these females is captured, it goes silent and falls dead. Why Don’t Muslims Speak Out Against ISIS?! They are!